BMW is testing a new bike in Spain which appears to be a cross between the firm’s R1200C cruiser and the K1200LT tourer. Witnesses say that despite the look, it shares almost no components with either bike. 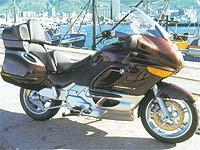 It seems to be a custom-styled tourer with a hint of the Harley about it. We should have exclusive pictures of it in time to publish in MCN on Wednesday, January 16. It is likely to be called the R1200LT and use a new version of the firm’s flat twin. It should have a power output of around 95bhp. BMW knows its flat-twin Boxer-engined bikes have a strong fan-base, and hopes the new tourer will attract buyers who wouldn’t consider switching to its four-cylinder machine. It has a curvier, retro-style which may attract more traditional BMW riders. Witnesses say it features a pair of small, vertically-stacked projector-beam lights mounted between the main headlights and that a huge, chrome headlight surround seems to extend across the whole nose of the bike. The bike’s chassis appears to be totally new, although its tubular steel design is not unlike that of the R1200C. The fuel tank, seat and bodywork are also new. The tank is particularly unusual, as it incorporates deflectors to keep the rider’s legs out of the airflow. This design means the bike should have the comfort of a fully-faired machine even though it looks like it only has an upper fairing. BMW also appears to be testing a slightly changed version of its R1150R with a new nose, replacing the current, retro-styled chrome headlight and separate instruments with an all-in-one plastic unit. The current, shiny aluminium forks and Telelever unit are replaced by black versions, while the current bike’s beak-like front mudguard is swapped for a more conventional hugger. The new machine is expected to go on sale alongside the current R1150R rather than replace it. The R1150R is likely to be priced at a similar level to the current, £6800 machine, while the tourer could come in at around £10,000.